I have always been intrigued by meringues. They look very complicated to make but they are oh so delicious. So what exactly is a meringue? It is a light and fluffy dessert that is usually baked in a pie. Usually, the crust is made of some sort of shortbread, a tart lemon custard filling and topped with a fluffy meringue. Now I love sweets just as much as anyone else, but sometimes a slice of pie is just too sweet. I wanted to turn my favourite pie into a classic cookie. My Lemon Meringue Cookies are the perfect bite size treat, while still having the classic pie taste. The process to make these cookies is a lot simpler than you think. Using a stand mixer and gently folding in the ingredients is what makes the cookies turn out nice and fluffy. 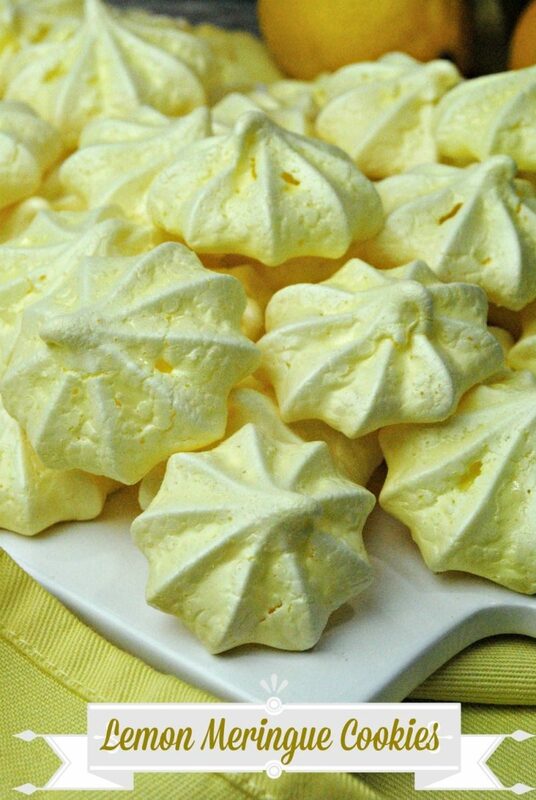 Here are a few helpful tips to make the perfect Lemon Meringue Cookies. Don’t rush! It takes time to make the eggs as fluffy as they need to be. Use a piping bag and a star tip to make the cookies. Don’t be upset if they don’t turn out perfect the first time. Add in the lemon and the food dye and mix until combined. I hope you enjoyed my Lemon Meringue Cookies as much as my family and I did. If you make it, make sure to share with us on Facebook or Twitter! Also, check out all of our other Recipes. Good looking cookies I am sure that I could enjoy daily. I love meringues, I will have to try these. Looks delicious! I love lemons and this looks delectable! Yum! Just pinned this, I am definitely going to have to try making these. We love anything lemon! I have never tried a meringue cookie, they sound good and light!! These look delicious. I’m always looking for new cookie recipes. Thanks for sharing! Yum! These cookies look amazing! I love lemon and meringue. I’ll will try those for sure. I have tried to make meringue & I’m not very good at it. Mine always look like big blobs haha. What I like about this is the lemon citrus for that bright flavor. I just need to get better at using the pastry bag! Let us know how you do with this recipe if you make it! I love the flavor of lemon in almost everything.These cookies look like they would melt in your mouth. I love how merginges melt in your mouth!!! I love anything lemon. These sound sooo delicious!! These look so delicious, and beautiful, too. I can’t get enough lemon desserts.. Thank you! « DISNEY STORE CELEBRATES ITS GRAND OPENING IN OTTAWA!